This product has been replaced by the Empire Builder (EB) and is no longer available. Click here to view the EB. The Digitrax Big Boy and Big Boy FX starter sets contained a DT200, DB100a, and an LA1 or LA2 (LocoNet Adapter). The Big Boy was shipped with one of the following mobile decoders, DH83, DH84P, DN94, DN140, DH84FX, DH83FX, DH84, DH140, or DN93FX. The DT200 is a combination DCC Command Station and Throttle. acting as the command station. Compatible with the NMRA Baseline DCC standard. Also incorporates many advanced recommended practices. Digitrax LocoNet network forms a simple, reliable interconnect between all Digitrax Command Control System components using extremely reliable and convenient gold plated RJ12 6 pin modular telephone jacks. 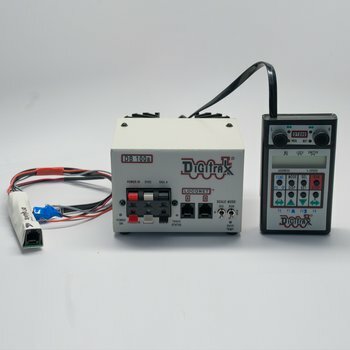 Built in programmer allows you to program each individual decoder's acceleration, deceleration, start-voltage, mid-point voltage, loadable speed table, etc. 128 speed step operation! You can select 14, 28, or 128 speed step operation for each individual decoder so you don't have to sacrifice performance if you have some decoders that have 128 speed steps and some that don't. LCD display & LED indicators show throttle status at a glance & make operation easy. Use either knobs or buttons to control speed and select addresses. Encoder Knobs give incredibly fine speed control. And when you select another loco, the knob position does not change the speed of that loco. No more rushing to adjust the throttle to match the loco's speed! UniVersalTM Consisting lets you use any DCC decoder for consisting. You can even include an analog loco in a consist. Add & delete locos from MU lash-ups with a few simple keystrokes. Run locos within a consist in any direction you choose. Head to head or tail to tail. Precision speed matching is a reality with Digitrax decoders with loadable speed tables. Control directional lighting & 4 additional function outputs from the keypad. Sound controls for bell & whistle are on F1 & F2. F2 is a non-latching control that allows you to sound the horn for as long as the key is held down. Control up to 127 switch addresses from the keypad.